Gintime’s Patience Gould was given a sneak preview of Beefeater Gin’s very wonderful new Home of Gin ahead of its official opening on Wed 21st May. And it’s wow, just WOW! I’ve often wondered what English sounds like to the foreign ear and more recently what it must be like for a tourist in London for the first time or come to think of it the second or even the third time. There is just so much to see – and now another attraction is on the touristic map; the only remaining historic gin distillery in the capital – Beefeater – now boasts a visitors centre, at its Kennington GHQ. Christened Beefeater London: The Home of Gin the centre is opening in time for the summer season, and this as you might expect from a producer in the classy Pernod Ricard-owned Chivas Brothers stable, is a triumph of uber-design and understated elegance. In short it’s a must visit. Designed by retail and hospitality agency Four by Two the Visitor Centre is incorporated in a new two floor cylindrical tower, complete with lift. It’s built in a space that originally housed the loading bays to the distillery, and the challenge was to incorporate the Still Room on the second floor, but without entering the production areas so as to avoid nightmare health and safety issues. Building the tower, which on the outside is cleverly clad in copper slats – a nice nod to the copper stills inside – easily overcame these logistical problems. Like the tower itself this is a two part tour. On the ground floor the entrance and reception area houses the shop and an illuminated display wall boasts an outline of the distinctive London skyline made using the red Beefeater bottle tops; visitors are then given an i-pad and move on to the tour which kicks off with an interactive induction into the 300 year history of gin and London, complete with cobbled streets and sounds of London. It moves on through the years to the art deco times, which coincided with the prohibition era in the US and the burgeoning of the cocktail movement. There’s a bar here which bears a remarkable similarity to the original Savoy Bar which was so central to the development of the cocktail thanks to its legendary bartender Harry Craddock who wrote the Savoy Cocktail Book first published in 1930. The original bar is now, incidentally, housed in the refurbished Cafe Royale and not the Savoy. Along the historic way interactive consultancy Contagious has designed films, animations, touch screens, soundscapes and iPad interpretations as well as the overall design of this section together with the branding and communication within the visitor centre. Then it’s up in the lift to meet the guide and it’s on to Beefeater tour part two. This as you’d expect, is all about the history of Beefeater and it includes a detailed profile of the founder, the pharmacist James Burrough – shows off the botanicals in the award-winning Beefeater Gins and how Beefeater’s packaging has changed through the ages – fascinating! The hospitality area is housed in glass so that visitors can see all the stages of distillation on the other side without having to wear lead shoes and hard hats! The opening of London’s first dedicated gin distillery visitor centre has already spawned one new Beefeater Gin variant – Beefeater London Garden Gin which is only available at the distillery shop, priced £22.50. As its name suggests Master Distiller Desmond Payne has taken inspiration from London’s Chelsea Physic Gardens, which are just a stone’s thrown from founder James Burrough’s original distillery in Chelsea. At 40% ABV, it combines the flowering herb lemon verbena and aromatic thyme with the signature citrus notes of Beefeater. And there’s also the limited edition Beefeater’s Spirit of London. This is already available in 26 markets, it is Beefeater London Dry Gin but its presentation is a one-off. This is a mix of patriotism with its striking Union Jack wrap-around design, and also includes the brand’s award-winning ‘My London’ global advertising by layering an image of Londoner Justin O’Shea, which was used in the campaign, underneath the Beefeater silhouette. It has dual purpose to underline Beefeater as both a modern London icon and a brand with real provenance and a long heritage. 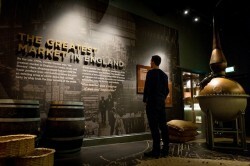 It’s also intended to arouse consumer curiosity and hopefully future visits to the distillery – well wouldn’t you know! Beefeater London: The Home of Gin is the capital’s first dedicated gin distillery visitor centre and is housed at the Kennington distillery which has been the home of Beefeater, the world’s best-selling premium gin, since 1958. Tickets are on sale via www.beefeaterdistillery.com priced at £12.